Winter is when craft cocktail bars really get in on the warming-cocktails game, even in states where the temps remain balmy. We&apos;ve rounded up a bevy of spirit-free options, too, so no matter what you&apos;re sipping, the forecast will be warm and fuzzy. Whiskey Thief, a rooftop bar atop Chattanooga&apos;s Edwin Hotel, takes its name from a tool used to "steal" a sample of a whiskey batch from the barrel. As you&apos;d expect, the menu leans heavily on whiskey-based libations. For the fall-winter menu, lead bartender Matthew Lawson created a contemporary riff on the Sazerac, starring a house-infused pecan-and-brown-butter rye that gets its rich, savory flavor from pecans toasted with salt, paprika and turbinado simple syrup. The flavors play well with the base flavors of Rittenhouse rye, which include baking spice, cocoa, citrus and vanilla, further echoed by the addition of smoked maple syrup. 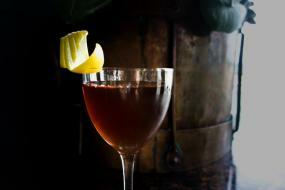 The rye and syrup are gently stirred with a couple of dashes of black walnut bitters and a few drops of absinthe, then strained into a coupe glass garnished with a lemon twist. While the rye lends the drink the requisite pleasant after-burn of warming whiskey drinks, for Lawson, nostalgia is the power player in this drink, evoking family memories of pecan pie and campfires.